Marty Crump has searched for salamanders along the Amazon River; she has surveyed amphibians and reptiles in hostile Huaorani Indian territory; she has been stung by a conga ant and had run-ins with an electric eel, a boa constrictor, and a bushmaster viper. In the course of her travels she has dined, not always eagerly, on wild rat, parrot, guinea pig, and chicken foot soMarty Crump has searched for salamanders along the Amazon River; she has surveyed amphibians and reptiles in hostile Huaorani Indian territory; she has been stung by a conga ant and had run-ins with an electric eel, a boa constrictor, and a bushmaster viper. In the course of her travels she has dined, not always eagerly, on wild rat, parrot, guinea pig, and chicken foot soup. 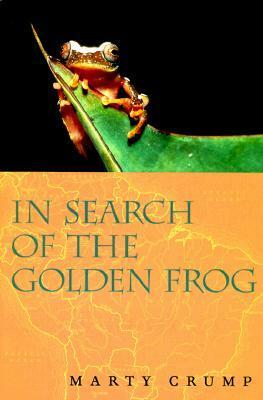 And for those among us who prefer our experiences to be vicarious and far away from biting insects, venomous snakes, and inhospitable surroundings, she has written In Search of the Golden Frog.The book is a detailed and fascinating chronicle of Crump's adventures as a field biologist—and as a wife and mother—in South and Central America. Following Crump on her research trips through Costa Rica, Ecuador, Brazil, Argentina, and Chile, we learn of amazingly diverse landscapes, equally diverse national traditions and customs, and the natural history of her subject of study, the frog. In leading us through rain forests and onto windswept coasts, Crump introduces us to such compelling creatures as female harlequin frogs, who pounce on males and pound their heads against the ground, and also sounds an alarm about the precipitous decline in amphibian populations around the globe.Crump's perspectives as both a scientist and a mother, juggling the demands of family and professional life, make this highly readable account of fieldwork simultaneously close to home and wildly exotic. A combination of nature writing and travel writing, the richly illustrated In Search of the Golden Frog will whet travelers' appetites, affirm the experiences of seasoned field biologists, and offer the armchair naturalist vivid descriptions of amphibians and their habitats. As a lab scientist who thinks anything involving mud and the outdoors is gross, I always enjoy reading about the adventures of field biologists. It must be fun (but also tough) to quantify species and study behaviors, and the author does a wonderful job conveying the enjoyable bits of field biology as well as the hardships of the field. A good read. A great book describing the career of a field herpetologist, including both the the wonders of the field sites she studies, the heartbreaking decline of the golden toads, and how a woman field biologist balances research with childrearing.